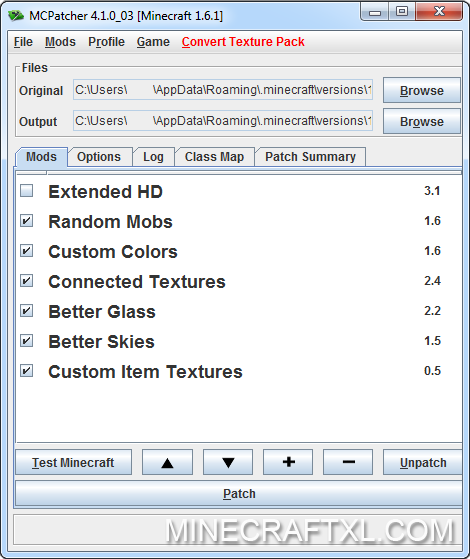 MCPatcher HD Fix for Minecraft is a great mod for Minecraft. It allows you to switch between mods and texture packs and comes with a lot of other features. It also lets you install new mods very easy via the interface. More transparency options for glass textures. Add your own textures to the day and night skies. Many options for fading and blending. Built-in utility for converting texture packs to resource packs 1.6. Ability to load other mods – for example ModLoader. Ability to save and load mod profiles and switch between them easily. You can also organize your mods by the Minecraft version they go with. Downlaod the MCPatcher for your OS. Unzip the files and open the MCPatcher (note: you should start with a fresh version of Minecraft). Download the texture pack you want to use. Press Esc and to to options. Put the zip file you downloaded in to the resource pack folder. The texture pack should now appear in Minecraft, choose the texture pack and click “Done”. If you have any problems, please comment and we will try to help. MCPatcher HD Fix support connected textures which some resource packs use.